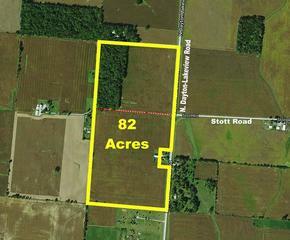 Productive 82 Acre Farm north of New Carlisle selling Wed, January 17 @ 4 pm. Productive 82 Acre farm being sold at public auction on January 17, 2018 at 4 PM. 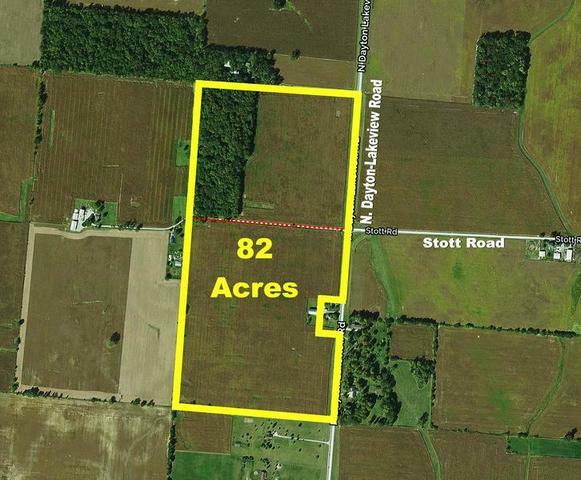 Includes 67 productive tillable acres with Kokomo, Celina & Crosby soils, plus 11 wooded acres with timber value and a barn. Also features over 2,400 feet of road frontage on N. Dayton-Lakeview Road (aka SR 235), providing excellent opportunities for multiple lot splits and great investment potential. Selling in one parcel. Flat topography and easy to farm. Located 4 miles north of New Carlisle, 10 miles east of Troy & 10 miles west of Springfield. Join us for this opportunity to purchase quality farm land. Auction conducted at New Carlisle American Legion Post 286, 2251 N Dayton-Lakeview Rd, New Carlisle, OH. Contact Sheridan & Associates for bidder packet and full details. Bidding Procedure: The property will sell in one tract to the highest bidder, subject to confirmation of the Seller. Downpayment: $30,000 as down payment will be deposited with the Auction Company on the date of auction upon signing of Confirmation of Sale Agreement; balance due at closing. Closing Date: On or before February 26, 2018. Purchaser will pay customary portion of closing costs at closing. Closing will be conducted by Elder & Elder, Springfield, Ohio. Possession: Date of closing, with no tenant’s rights reserved. Easement: An ingress/egress easement exists through the middle of the farm to provide access to the properties located directly west of the farm at 5791 and 5795 N. Dayton-Lakeview Road. Improvements: No direct access or easement from N. Dayton-Lakeview Road is available to the barn located on the property. Contact Auction Agents directly about details and contents of this barn. Disclaimer & Absence of Warranties: All information contained in this brochure and all related materials are subject to the terms and conditions outlined in the Confirmation of Sale Agreement. Announcements made by the Auctioneer at the time of the Auction will take precedence over any previously printed or oral information. The property is sold on an “AS IS, WHERE IS” basis, and no warranties or representations, either expressed or implied, concerning the property are made by the Seller or the Auction Company. Each bidder is responsible for conducting his/her own independent inspections, investigations, inquiries, and due diligence concerning the property. The information contained in this brochure is believed to be accurate, but is subject to verification by all parties relying on it. Neither the Seller nor the Auction Company assumes liability for its accuracy, errors, or omissions. Conduct at the auction and increments of bidding are at the direction and discretion of the Auctioneer. The Seller and the Auction Company reserve the right to preclude any person from bidding if there is any question as to the person’s credentials, fitness, legal capacity, etc. All decisions of the Auctioneer are final. Improvements: No direct access or easement from N. Dayton-Lakeview Road is available to the barn located on the subject property. Contact Auction Agents directly about details and contents of this barn. From I-70 between Springfield & Huber Heights, take SR 235 (Exit 41) (aka N. Dayton-Lakeview Road) north through New Carlisle to property. From Troy, take SR 41 east to left on N. Dayton-Lakeview Road to property. From Springfield, take SR 41 west to right on N. Dayton-Lakeview Road to property. Located just north of State Route 41 at the intersection with Stott Road. Watch for signs.